SAFE SPACE — Consequence assessor Theresa Rolfe holds a photo of her son Ted Benoit. Rolfe started the Family and Friends of Addicts Support Group at Sandia to give employees a place to share what they’re going through. Her son was addicted to heroin and now works full-time at a recovery center in Connecticut where he helps men with drug and alcohol addiction. Almost every morning on her way to work, Theresa Rolfe drives past homeless people outside a fast food restaurant, and the sight takes her back to a time when her son could have been among them. It wasn’t too long ago that Theresa, who works in emergency management, cried all night wondering why he had left a detoxification facility with nothing more than an extra pair of underwear. He’d been to drug rehabilitation and relapsed, and for a while, his location was a mystery. From the day she found out he was addicted to heroin until she found online support groups where others dealt with similar issues, Theresa said she felt alone. 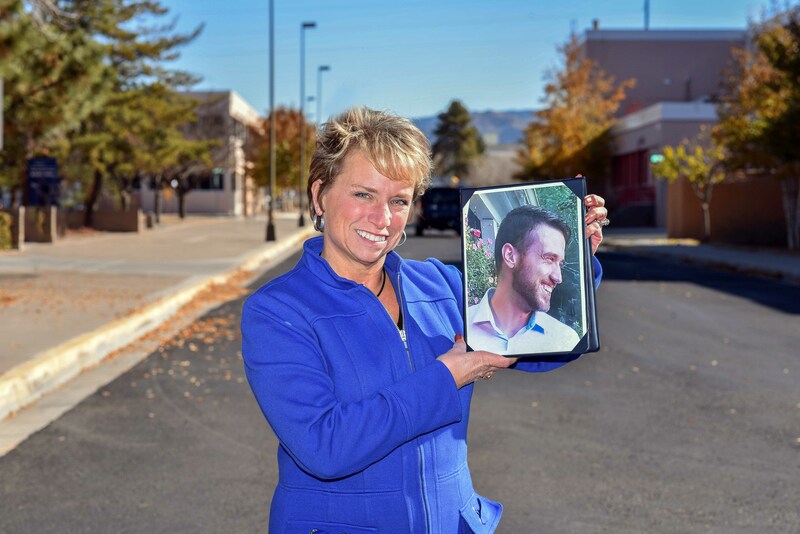 Her son has been clean and sober for more than a year now, and she has others to talk to. However, because she doesn’t want others to experience the same dark roads, she formed a support group at Sandia. The Family and Friends of Addicts Support Group meets twice a month during the lunch hour to discuss what members are going through. Theresa’s son went through rehabilitation twice, but she knows others at the Labs are struggling. Since starting the group, she’s had several employees call to talk and managers call on behalf of staff members. Theresa’s son now works full-time helping other men through drug and alcohol addiction at the facility that helped him get clean, in Connecticut. Theresa is very proud of where he is now. Although Sandia endorsement isn’t required, Theresa went through the Labs’ onsite counseling office before starting the group, and gained support from Sandia clinical psychologist Kristina Rynes. Before the support group began, others had established alliances for grieving employees and caregivers at Sandia. Staff can also reach out to counselors for individual help with anxiety, depression, marital issues and workplace problems, and counselors can guide them to long-term therapy if needed. Kristina doesn’t attend the support group meetings, but if someone in the group wants to talk to a professional or if they need a guest speaker, she can help. At Sandia, onsite counseling is free. It’s common in the workplace for people to keep quiet about struggles with family and friends, and at Sandia, there’s the added worry about losing security clearances, which are required for most jobs at the Labs. Sandia requires self-reporting of drug abuse, and employees are also subject to random drug screenings, but they won’t lose clearances based on the behavior of family or friends. His productivity went downhill when Ian discovered his dad used cocaine and methamphetamines, and the ups and downs continue. He always knows when his dad isn’t doing well when collection calls come in, or when he receives another driver’s license for his dad in the mail. Ian and Theresa both said even when things are going well, it’s a state of fragile calm. If group attendees don’t feel like talking during the meetings, Theresa comes prepared with topics related to drug addiction. She knows numbers and statistics, has advice about finding good rehabilitation facilities and learns about events that could be helpful for those in the group. Ian said the support group gives attendees a place to connect with others who understand drug issues, unlike friends and co-workers. Theresa said she hopes as more people find out about the group, more will attend. The Family and Friends of Addicts Support Group meets the first and third Wednesday of the month from noon-12:45 p.m. in Building 823, Room 2093. Questions to Theresa Rolfe at 505-844-1702.